I prepared this material because my students were a little confused about the difference between Simple and Progressive present tense. It was pretty useful. Hope it helps you, too. This worksheet has ONLY comparative form. It has a second part where students match words with their definition. Students will work present simple form of Have. Affirmative, Negative and Short Questions. 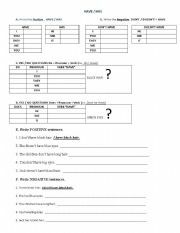 Simple Present - Spelling of the verbs Worksheet. This poster has grammar rules, Spelling, Signal Words and examples in Simple past. Unfortunately, there�s a mistake, instead of "were" I wrote "where". I didn�t notice but you can fix it with a Text box. Thank you and sorry I promise I would check my posters five times before uploading them. This is a very useful poster about present simple. Includes adverbs of frequency percentages and some examples. Hope you like it. This is actually a worksheet where students can write a short description about family members, such as name, age and a short appearence description. I couldn�t upload it as Word document because it was too heavy.